Engine Capability Caterpillar heavy duty diesel engines are capable of combusting a controlled amount of diesel engine crankcase oil correctly blended into the diesel fuel without severe engine problems. In general, accelerated engine wear is not expected when the correct blending and filtration procedure is used; however, fuel filter replacement and fuel system wear, particularly with the newer high injection pressure fuel systems needs to be monitored. It is the intent of Caterpillar that the consumption of used engine oil by Caterpillar heavy duty diesel engines be limited to only the drain oil from these engines. In mixed fleets (or sites) where the drain oil is being consumed by all engines equally, the burning of drain oil from other diesel engines is acceptable. 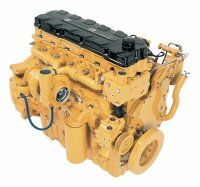 If other engines in a fleet (or sites) are not burning their used drain oil, only the used oil from Cat engines should be consumed by Cat engines. The following information outlines the recommended procedures for burning used diesel engine crankcase oils in Caterpillar heavy duty diesel engines. Any variation in the recommended procedures can result in reduced fuel system and engine life. Only diesel engine crankcase oils can be mixed with the diesel engine fuel supply. Under no circumstances should gasoline engine crankcase oils, transmission oils, hydraulic oils, greases, cleaning solvents, etc., be mixed with the Caterpillar diesel engine fuel supply. Also, never use crankcase oils contaminated by water or antifreeze due to engine coolant leaks or poor storage practices. Clean handling techniques of the used diesel engine crankcase oils are essential in preventing contamination of the diesel fuel supply from outside sources. Caution : Do not burn crankcase oil that has a milky appearance in your engine. Engines equipped with an oxidation catalyst (often referred to as a catalytic converter) should not use oil/diesel fuel blends. A fuel mix of less than 1% is recommended where fuel filters are subject to plugging from the waxing of cold diesel fuel. An oil and fuel mix cannot be used if exhaust valve deposits have been a problem. Use a duplex fuel filter that permits element or canister changing while the engine(s) are operating. Onboard personnel must know how to change fuel filters, bleed the fuel system and restart the diesel engine(s). Blending Adequate premixing and filtering of the used diesel engine oil and fuel is essential. Clean handling techniques of the used diesel engine crankcase oils are essential in preventing contamination of the diesel fuel supply from outside sources. Do not mix/blend in open containers. For bulk blending it is strongly recommended that after-market devises designed to provide proper handling, filtering, and blending be used. Use proper filter maintenance intervals for the filtering /blending unit. Lube oil and fuel will combine and not separate if properly premixed. Before addition to fuel tanks on the truck or adding to bulk storage tanks, mix an equal amount of used oil with diesel fuel (50- 50 mix). Filter this mixture through a superior grade fuel filter (Cat fuel filter part no. lR-0749 or equivalent 2 micron) prior to addition to the fuel supply tank. Visually inspect the mixture looking for globules of undiluted lube oil that can lead to premature fuel filter plugging. If globules of undiluted lube oil are present, the fuel lube oil mixture needs to be agitated, filtered or reblended to assure blending of the lube oil and fuel. If the globules do not dissolve with additional blending, this can signal oil contamination with water, antifreeze, or other compounds that do not dissolve in or combine with diesel fuel. Do not burn used oil that does not mix completely in diesel fuel. To complete the blending process, add the 50-50 mix to the fuel supply tank first and then add a substantial amount of clean diesel fuel to that mixture (top off tank). Bulk Blending and On-board Blending . When consuming used diesel engine oil from more than one engine on a continuous basis, an average ratio of 1% lube oil to diesel fuel can be burned without a significant increase in engine deposits. The ratio of used oil to fuel may vary due to the amount of fuel in bulk storage facilities. At no time should the ratio of used crankcase oil to fuel in a bulk storage tank exceed 3%. The lube oil must be premixed and filtered as outlined under the Blending heading. Example: A fleet of Caterpillar engines can operate continuously on a mix of 100 gallons of properly filtered and premixed used engine oil to every 10,000 gallons of diesel fuel in a bulk storage facility. When consuming the used crankcase oil from a single engine at the time the oil is changed, a one time ratio of up to 5% oil to fuel can be burned immediately following the oil change. The oil/fuel mixture must be split between tanks on a dual (saddle tank) system. The lube oil must be premixed and filtered as outlined under the Blending heading. Example: Ten gallons of used engine oil, properly filtered and mixed, can be added to 200 gallons of diesel fuel and burned after each recommended oil change interval. On-Board Blending When a continuous blend system is installed to draw oil from the engine crankcase to the truck fuel tanks, the rate must not exceed the equivalent of a 0.5% ratio of used oil to diesel fuel. The 0.5% ratio is the maximum average ratio than may be used. The correct selection of used oil to fuel ratios (not exceeding the maximum allowed) when using blending systems not manufactured by Caterpillar is the responsibility of the system manufacturer and the customer. The lube oil must be filtered through a Cat lR-0749 fuel filter or equivalent (2 micron) and be routed early into the fuel return line, to enhance oil/fuel blending. The used, filtered, oil must not be routed directly into the fuel tank(s). The filters may require more frequent replacement than is necessary for fuel filters on these engines when not burning used crankcase oils. The fuel level should not be allowed to drop below a quarter tank, as bypassed fuel will continue to raise the average oil level in the tank.